Seen on Saturday: Don’t go to Dan Murphy’s for your booze — keep going and come to Winelovers Warehouse instead! Technically they’re their truck is illegally parked, of course, hanging out of the parking space into No Standing territory. But I wonder how many people were suckered in? Well spotted. I go to Winelovers sometimes. The Goulburn Valley shiraz ($2.50 per bottle) is very drinkable. 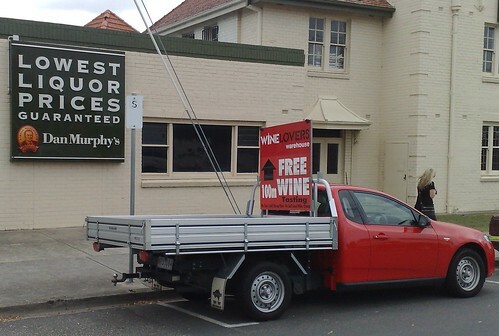 Very cheeky sign, but keeps Woolworths (who own Dan Murphys) on their toes. PS typo “they’re” should be “their”. The sangria mix is meant to be very popular this year. “You have just the hat to drink it with” is not what I expected when I bought a bottle. I love how the sign says “FREE WINE (tasting)” It’s always good for a laugh to see advertising like that!